Get tighter, firmer and younger looking skin with HIFU, this amazing, revolutionary treatment can help restore the structure and elasticity of your face, neck and jawline. It is also effective at reducing stubborn areas of fat and tightening of the skin on the body. HIFU stands for ‘High Intensity Focused Ultrasound’. HIFU is a non-invasive treatment that works by targeting deep layers in the skin – it stimulates new collagen production and collagen regeneration. HIFU provides an excellent alternative to invasive surgical procedures, it involves no needles or scalpels and benefits from no downtime! The treatment is quick, effective and very tolerable and the results can be seen instantly and continue to develop for around 12 weeks post procedure. 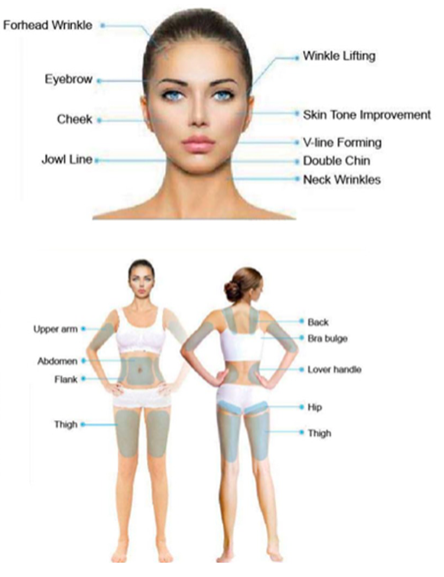 HIFU results in skin tightening, skin lifting and body contouring. HIFU is the latest revolutionary fat loss treatment. HIFU for fat reduction works by targeting specific areas of fat in the face, neck and body. HIFU delivers focussed ultrasound waves to a precise depth in the subcutaneous fat layer to cause destruction of the fat cells as well as tightening the skin in the area treated. The treated fat cells are carried into the lymphatic system and removed by the body’s natural fat removal process. This process continues for up to 6 months after treatment. Results of fat reduction treatment varies from person to person dependent upon a variety of factors, such as genetics, age and different skin types. What can HIFU be used for? HIFU can be used to perform a non-surgical face and neck lift as well as being effective at treating various areas of the body. Prior to having HIFU treatment it is necessary to have an assessment with our therapist Laurie to go over your treatment expectations, discuss any relevant health considerations you may have and answer all your questions about treatment. If you are happy to do so we will perform a patch test with the device, this involves applying HIFU to a small area (usually just under your jawline) to check your tolerance levels to the treatment and rule out the risk of any adverse reactions. Following successful patch test you can begin your treatment 2 weeks later. The images below show the results 1 week post-procedure, you can see the tightening of the jaw line, improved definition, reduced lines around the mouth and also a reduction in the fat under the chin. This is just 1 week after the procedure and results will continue to develop over the next 3 months. "Over the past year or so I have noticed a huge change in my face. Despite not putting on weight elsewhere on my body, my neck and chin have really piled on the weight for no apparent reason. I have tried diet and exercise, lost weight elsewhere but this area just seemed to be getting worse. I heard about HIFU and thought I would give it a try and I have been absolutely amazed by the results. After just 1 week I can see a visible change in my face and neck, I even had a photograph taken that I didn't immediately want to delete! The treatment was very easy, it was mildly uncomfortable at times but very tolerable (and I am a total wimp). Laurie was amazing and really looked after me all the way through, making sure I was comfortable at all times. I would highly recommend this procedure, I have already booked in to have another area treated!"